Operating Scoot and Tigerair as one will not lead to job cuts, Singapore Airlines (SIA) said yesterday, as it announced that a new entity has been set up to house and run its two budget carriers. There are no plans for retrenchment but organisational changes from the integration could see some staff take on different roles, according to SIA spokesman Nicholas Ionides. 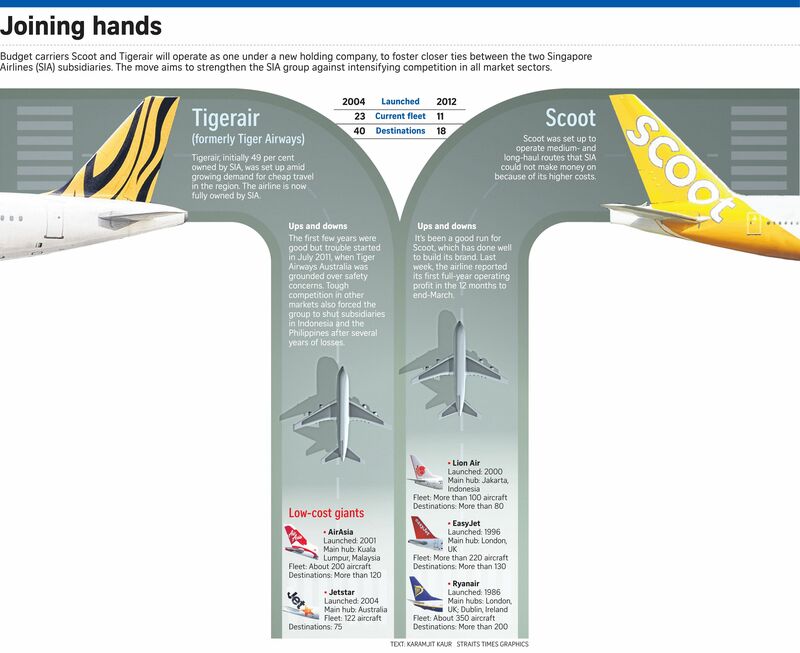 Scoot has more than 900 employees and Tigerair has about 850. Confirming a report in The Straits Times yesterday that a new holding company would be set up, SIA said this will lead to sharing of key functions, such as in sales, marketing, and planning and operations. The new company - Budget Aviation Holdings - is being helmed by Tigerair chief executive Lee Lik Hsin. Scoot boss Campbell Wilson will return to SIA in late August as acting senior vice-president (sales and marketing). While no jobs will be axed, Scoot will lose two of its key executives - chief commercial officer Steven Greenway and head of ground services Benson Tan, who have both decided to quit. In an e-mail to staff, a copy of which was obtained by The Straits Times, Mr Wilson sought to allay any concerns. "Our baby is in good hands," he said. "Lik Hsin knows Scoot as well as any outsider can, having helped craft the original business case and having served as one of Scoot's directors in our first couple of years." From having five staff when it started in 2011, Scoot has grown to having more than 900 employees and 11 planes, and has carried seven million passengers. In the year to end-March, the airline made its first full-year operating profit. "It is incredibly tough to leave," said Mr Wilson, adding that he "wholeheartedly" supports the integration. Mr Goh Choon Phong, SIA's chief executive and chairman of the new entity, said: "The holding company structure will drive a deep integration of our low-cost subsidiaries, which are important parts of our portfolio strategy in which we have investments in both the full-service and budget aspects of the airline business." Mr Lee added that there are many opportunities ahead for Scoot and Tigerair to work more closely together, which will provide new opportunities not just for the growth of both airlines, but also for the benefit of travellers. A merger between the two airlines had been expected since SIA said last November that it had made a takeover bid for Tigerair, of which it owned around a third at the time. A full merger will have implications for airline and aircraft registration, as well as licensing. Transferring air traffic rights granted by foreign regulators from one airline to another is not always possible. Mr Goh, who had been asked before if a full merger was the ultimate aim, last week told reporters: "We would not rule it out. But for the moment, we do see a benefit in them having their own separate identities."